​Found objects can be common objects that are easily found, netting, lace, plant clippings, twine, paper and more. During this workshop we will use found objects and materials to create original multilayered prints. Build up your image with ghost prints and painterly monoprinting in conjunction with your printed found objects to create a unique finished artwork. You will be able to make intuitive and gestural marks allowing the medium of monoprinting to be your guide. You will be encouraged to ‘play seriously’ with marks and colours and be open to the creative processes of this type of monoprinting. Enjoy yourself finding new and effective ways of expression. This is a playful and experimental workshop where no press is needed. 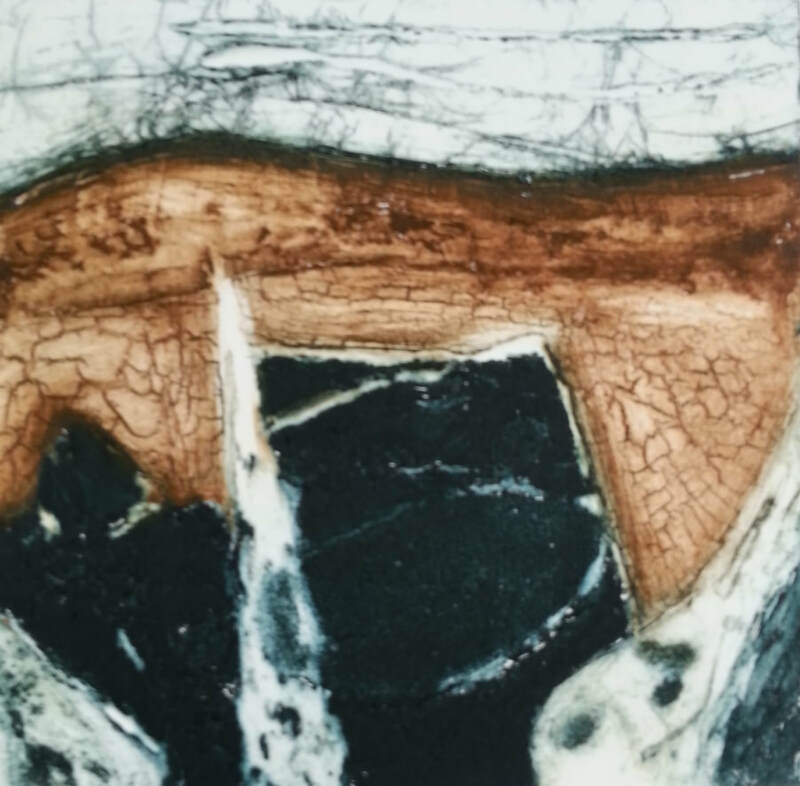 ​Monoprinting is an accessible form of printmaking that requires a minimum of technical application and materials. The resulting prints can range from a ghostly impression to a bold statement and therefore effective for a broad range of ideas. When involving painting and drawing monoprint is ideal for those who wish to evoke more painterly effects from within the print. The creative process encourages experimentation and imagination.The results can sometimes be unexpected, which gives the opportunity to adapt and develop ideas within the work. Drypoint is a direct way of making an intaglio print. You will be shown how to build up your drypoint plastic plate creating line and tone to add depth and how to ink and wipe your plate to show subtle variations. This technique can produce simple strong images with emphasis on the texture and quality of line unique to drypoint where the ink is held in the burrs kicked up by the needle giving the image its characteristic velvety line. 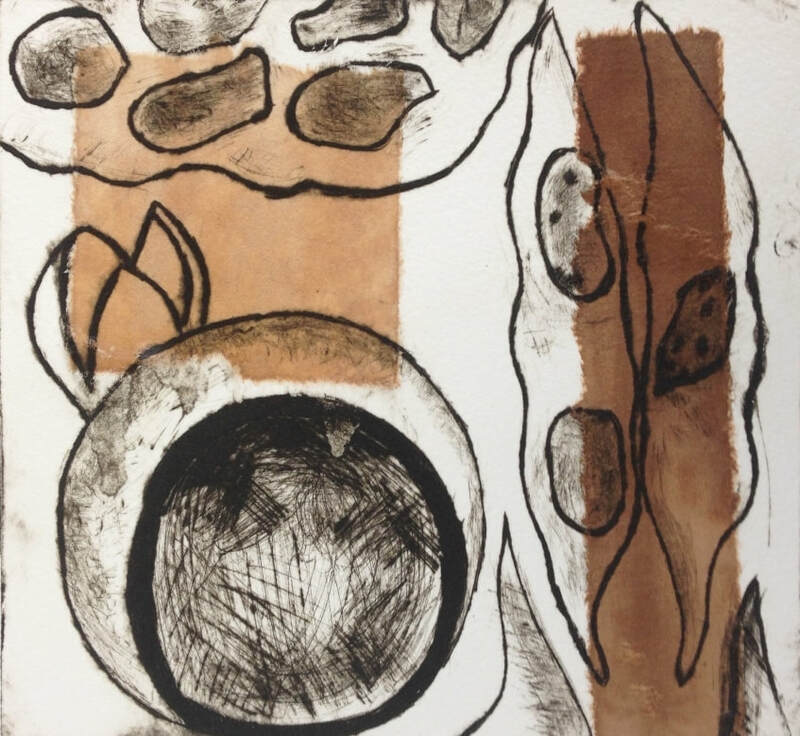 We will explore different ways of mark making using various tools to create texture and line as well as using a variety of ways to inking up the plate to achieve desired effects. We will use heavily varnished card which I find more robust than drypoint card. As well as being drawn into with a needle, the plate can be cut into to create areas of greys. It can be sandpapered creating a more textured tone. You will be shown how to build up your drypoint plate creating interesting lines and tones and how to ink the plate to best show subtle variations. Collograph is a printmaking technique using a plate that is made from textured materials glued to a backing plate much like a collage. Rich tones can also be created with the additional use of carborundum powder (silicone carbide crystals). The resulting plate can be printed in intaglio, relief or both and can be combined with other techniques. Participants will learn a variety of techniques for making collograph plates using plaster, textured materials and gel mediums. Participants will also learn how to ink and print a collograph including how to apply colour rubs . A solarprint is made from a light sensitized photopolymer plate used by artists as an alternative to etching. The plate is exposed to uv light then washed out in water.This environmentally friendly printmaking technique does not require the use of acid or other harmful chemicals and is a quick and versatile technique. ​ It can be used to produce images that can be printed in both intaglio and relief using hand drawn images, photographs, natural materials, photocopies etc as the starting point to making a plate. Participants will be able to experiment with single and double exposure plates using a stochastic screen. They will learn to ink and print their solar plates including colour rubs on their single exposure plates. Ink is rolled onto a plate. The image is developed by drawing into the ink or manipulating it using additive or reductive techniques. The appeal of monoprinting lies in its unique translucency that creates a quality of light very different from painting on paper.